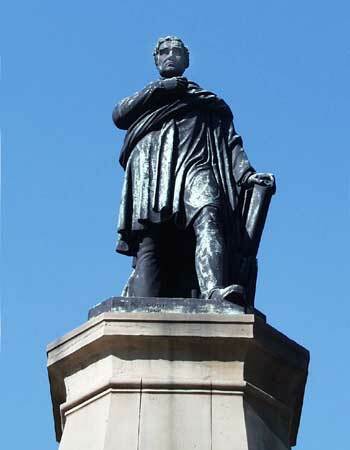 The George Stephenson Monument at the junction of Westgate Road and Neville Street. Location: Westgate Road/Neville Street, Newcastle. Materials: Bronze and Sandstone. Listed: Grade II. In April 1859 Lough's plaster model was exhibited in the nearby Literary and Philisophical Society before it was sent down to London to be cast in Bronze. On 3rd October 1862 the monument was inaugurated at an elaborate ceremony attended, so it was claimed, by over 100,000 spectators.